winnietsuii: Hello Kitty x Maybelline Volumn Express (Limited Edition) Review + Giveaway! Hello Kitty x Maybelline Volumn Express (Limited Edition) Review + Giveaway! Of course I picked up something for you girls when I was in Hong Kong. HK to me not only stands for Hong Kong but also Hello Kitty - A old friend of mine who has been with me for more than 20 years. Anyhoo, I wanted to do a quick giveaway (~1week) to thank you each and every one of you for being so supportive and big part of my life since I started blogging here. I figured this would be a little something to spice up the stocking stuffers - something tiny and cute. I am making this giveaway as easy as possible and I hope you all participate! 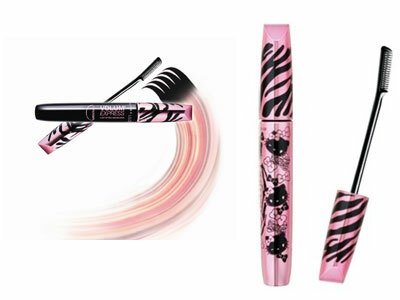 The product was launched in fall 09 that claims to be waterproof, hypercurl and last 18 hours. With all the good things it claims (though its probably not gonna last 18 hours-_-) and its super duper cute packaging... who can resist not buying?? Definitely not me! The one you'll be getting! and the one I am using for demo! Leave ONE comment below with the information you have (I will check!!) and you're IN! Ends on Dec 31st! Winner will be announced on Jan 1st 2011! Have a wonderful Christmas and GOOD LUCK everyone!